MS 1 - Small and light! 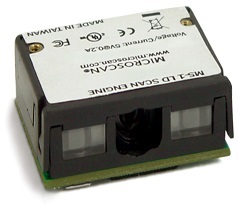 The MS-1 is one of the smallest and lightest fully decoded scan engines in its class. Featuring small size and reliable performance with minimal budget impact, the MS-1 offers embedded power management, a bi-directional serial link for dynamic configuration, and both a low and high density version. The MS-1 is the ideal scan engine for OEM design engineers seeking a dependable and inexpensive embedded barcode scanning solution. Compact & Lightweight: MS-1 has a footprint of 1.26" (32 mm) by 0.95" (24 mm), and is 0.44" (11 mm) tall. The engine weighs less than 0.3 ounces (8.4 g) for easy mounting onto robotic equipment or into tight spaces. Reading Capabilities: The MS-1 engine can easily read the most difficult codes, and excels at reading on highly reflective surfaces. Easy Setup: ESP software provides easy configuration of the MS-1, including selectable trigger and symbology setting.